Grammy-winning violinist Augustin Hadelich joins Music Director Ludovic Morlot and the Seattle Symphony for Beethoven’s Violin Concerto, September 20, 22 & 23. 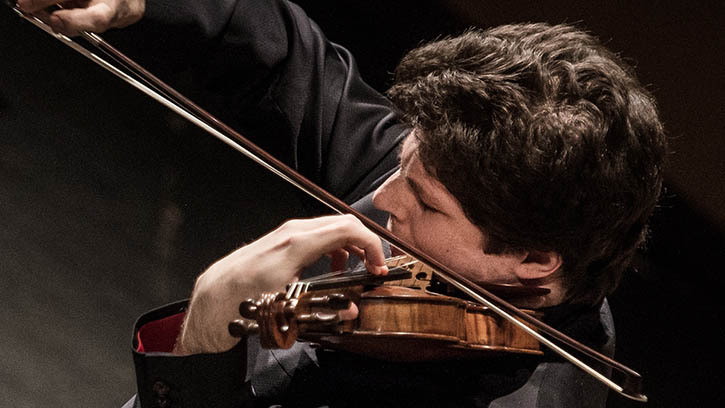 Violinist Augustin Hadelich has enjoyed a busy summer, circumnavigating the globe for concerts in Europe, New Zealand, Singapore and the United States, including an appearance with the Seattle Chamber Music Society in July. A favorite of Seattle audiences since his debut with the Seattle Symphony in 2010, Hadelich returns for his sixth appearance with the orchestra on September 20, 22 and 23, performing Beethoven’s elegant and lyrical Violin Concerto. As Hadelich explains, it’s a work with which he is intimately familiar. Written in 1806, Beethoven’s only concerto for the violin is not a virtuoso showpiece written to flatter a renowned performer. Instead, the concerto is expanded into a 40-minute journey, the music carrying us along through sweeping melodies, dense knots of sound and, finally, to a jubilant finale. For his concerts with the Seattle Symphony, Hadelich will perform the famed cadenza written by violinist Franz Kreisler, an early advocate for the concerto. Kreisler was also the first soloist to perform the concerto with the Seattle Symphony at the Moore Theatre in 1909. In addition to Beethoven’s Violin Concerto with Hadelich, Morlot and the Seattle Symphony will perform two orchestral showpieces from Claude Debussy’s Images — Gigues and Rondes de Printemps — as well as Leoš Janáček’s The Cunning Little Vixen Suite, a selection of music from the Czech composer’s charming opera about an orphaned fox cub. Don’t miss violinist Augustin Hadelich performing Beethoven’s Violin Concerto with Music Director Ludovic Morlot and the Seattle Symphony, September 20, 22 & 23! Augustin Hadelich has enjoyed a close relationship with Music Director Ludovic Morlot and orchestra over the years. He won his first Grammy in 2016 for his performance of Henri Dutilleux’s violin concerto, L’arbre des songes, from the orchestra’s cycle of the French composer’s major orchestral works. Listen now to the Seattle Symphony’s Grammy-winning recording of Dutilleux’s L’arbre des songes with violinist Augustin Hadelich! The Seattle Symphony’s 2018–2019 Masterworks Season is sponsored by Delta Air Lines. Augustin Hadelich’s performances are generously underwritten by Dale and Leslie Chihuly.